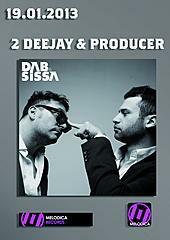 Dab & Sissa is a prominent Italian duo, consisting of Diego Abaribi and Marco Sissa, CEO & Head of productions of their own label, Melodica Records, an independent record label specialized in dance music. there Brothers (22 gold discs and over 16 million copies sold around the world) and continued with the arrival of Marco, that became in the last years one of the best Italian producers after gaining experience with Germany, Spain, USA (works and remixes for Michelle Weeks, Gloria Gaynor, Get Far, Barbara Tucker, Missy Elliot, Lenny Kravitz...'). The label's roster represents Dab & Sissa's tastes in dance and house music. Their shared work as duo started with the single "I wonder" licensed all over the world, "LIFE", a massive radio heavy rotation track in Italy, France, Spain, Germany, east Europe, Russia and South America, and DJANA, a brand new tune that is gaining momentum among top dj's. As remixers they worked on artists such as Lenny Kravitz, Serebro, WTF, Alexandra Stan to name a few..
unique atmosphere for a never heard dj-set."